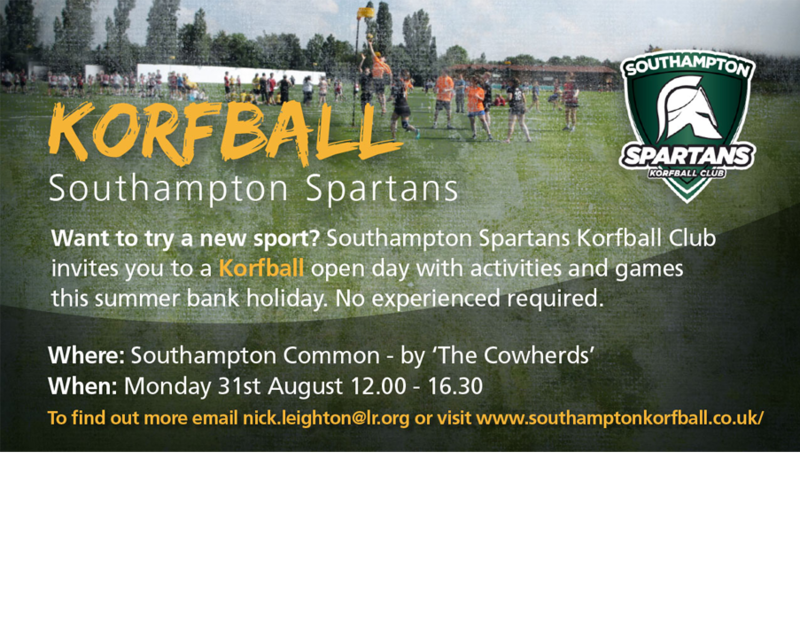 Southampton Spartans Korfball Club would like to invite you all to our Open Day on Bank Holiday Monday 31st August 2015 at Southampton Common. We love korfball so much that we want to spread the korf love to as many of you out there! No experience necessary, all you need is a pair of trainers and you are ready to try the sport that everyone’s talking about! You’ll find us on Southampton Common by Cowherds pub. There will be two sessions, 12pm-2pm and 2pm-4pm. But feel free to come down anytime between 12pm and 4pm and stay for as long as you like! Our first indoor training of the season will be held on Tuesday 1st September at Bitterne Park School 8pm-9.30pm. So if you can’t make the Open Day, please join us at our first indoor session! As there is some uncertainty as to whether the weather will hold up for this Open Day, please keep an eye on our Facebook page for the most up to date news on this exciting event! For more information, click contact us via the website or find us on Facebook!